If at any point you question feelings of a heart attack you should immediately call 911. Heart disease is the No. 1 killer of women in the United States. Heart attack symptoms in women can look very different from men’s. Nothing like the typical movie/tv representation of someone clutching their chest and then falling to the floor. Actually, absence of chest pain is more commonly seen in women than in men. One reason women dismiss heart attack symptoms is because they are busy caring for others. Women, and sometimes their doctors, blame their symptoms on other less threatening issues such as acid reflux or excessive fatigue. Not understanding the symptoms could possibly be life threatening. Weakness or extreme undeniable fatigue. Excessive sweating even without exercise, or more than usual. Pain or burning in either arm, the upper back, neck, throat, jaw or stomach. Restlessness; feelings of anxiety, not being able to sleep at night, an overall feeling of doom or uncomfortable uneasiness. 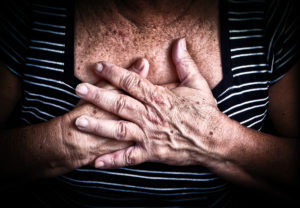 Chest pain or tightening of the chest is still the most common symptom of a heart attack. Uncomfortable pressure, squeezing, fullness or pain in the center of your chest. It lasts more than a few minutes or goes away and comes back. Even though chest pain and discomfort are the most common sign of a heart attack, being aware of the other symptoms is extremely important. Women are somewhat more likely than men to experience some of the other common symptoms, particularly shortness of breath, nausea/vomiting and back or jaw pain. A heart attack is a serious and potentially fatal medical event that requires emergency treatment. Heart attack symptoms in women tend to differ than symptoms in men and more often get overlooked. If you are showing any signs that concern yourself or a loved one you should see a trusted care physician right away. If the symptoms seem severe, 911 should be called immediately. Saving time and getting medical treatment faster is a life saver.